Once upon a time in the Kingdom of Carolina, the Regent of the North issued a proclamation: "Be it known far and near that every village and hamlet shall prepare exceptional opportunities for its children to enrich their lives by presenting the finest actors, singers, dancers, musicians, storytellers, puppeteers, magicians, and all-round wizards in Festival Celebration!" And in the beautiful foothills Hamlet of Polk, Village of Tryon, gifted educators and singers and artists and actors and philanthropists rose up and said, "Yes! Absolutely! We shall create one Saturday in the month of March a Children's Theater Festival!!" And so, Gentle Reader, Super Saturday was born March 10, 1979. In that first Festival's program, General Chairman Emmie Mackay wrote, "May Children's Theater Festival become one of our community's finest traditions." It certainly has, and each year, the Children's Theater Festival carries on this now rich tradition – with many of the young ones who attended those original Super Saturdays now bringing their own children to get swept up in the thrill of the performing arts and have their imaginations set racing! Joe Wray, who became Community Schools Coordinator for the fledgling endeavor, and his wife, Frances, sat down with me to explain how in the world one starts from nowhere to figure out the best way to meet the State and Governor Jim Hunt's wish for communities to provide enrichment to their children – and then once they figured it out, how to bring it to fruition. In the 1970s there had been some children's theater activity locally beyond school and church plays. A production of "Camelot" had kids playing the animals in Morgan Le Fey's forest, and they had a ball. Then there was an improvisation based on Marlo Thomas' "Free to Be You and Me" and the Banana Split Theatre performing at Sunnydale (now El Chile Rojo). The kids loved it all. In 1978 a group came together to discuss children's theater and the possibilities that were out there: Joe Wray, Emmie Mackay, Lee Mueller, Mary Ann Claud, Sunny Grenfell, Gus Hoffman, Ann McCown, Franklin and Sadie McKaig, Jim Moore, Clara Rogers, Ed Ryerson, Jack Wheaton, Geoff and Alice Tennant, Ann Stubbs, Helen McBirney, and Jane Dalton. Says Wray, "There was an absence of cultural activities for children in Polk County, nothing programmed specifically for children, and we wanted to provide that, not only chances for kids to perform themselves, but also to see really good theater." Now the energetic planners knew what they wanted to achieve. But how to get major funding beyond Governor Hunt's initial grant? How to learn what children's performances were out there? How to plan a balanced festival offering a wide variety? And how to have all these performers available in Western North Carolina on one particular Saturday in March? On March 10, 1979 the very first Children's Theater Festival took place in Tryon, with performances in the Tryon Fine Arts Center and parish halls of the Church of the Holy Cross and Congregational Church. Audience response was so enthusiastic that by March 1980, two more venues had to be added: Tryon Elementary School Auditorium and Tryon Elementary Gym. In March 1979 many youth of the community joined the Converse College Opera Workshop on the Fine Arts Center stage in "Hansel and Gretel," a project spearheaded by Mary Ann Claud, and by March 1980 120 students teamed up with the Converse Opera Workshop in "Noye's Fludde." With a smile, Community Schools Coordinator Joe Wray remembers those "Noye's Fludde" kids backstage at TFAC asking how long they had to stay there – they wanted to hurry up so they could get to the other venues to see that year's productions: "Lolligags," "Ama and the White Crane," "Festoons: Mimes and Clowns," "Body Music," and "Aladdin." No wonder those kids were eager to hurry off to see more! So how did the powers-that-be come up with the acts presented? First of all, the organizing think tank wisely decided a committee cannot put together a festival. There had to be a single Program Chair to build balance into the offerings, with that person reporting to the General Chair. And as for the original General Chair Emmie Mackay, "She knows how to run an army. It wouldn't have worked without her," says Wray. The early years of the Children's Theater Festival saw Sunny Grenfell, Mary Ann Claud, Lee Mueller, Alice Tennant, and Sadie McKaig variously as Program Chair. They traveled far and wide looking for performers and performances to book, often attending children's theatre/arts-in-education showcases, and contacting other presenting organizations to get recommendations. In Philadelphia, Joe and Frances Wray once saw a three-person troupe from the Cirque du Soleil in its early years before its fame spread worldwide. Brilliant – but the $25,000 price tag was too much for the Children's Theater Festival, and besides, they would need more room than the Tryon Fine Arts Center stage could provide. But the quality of performers out there was clear, and the Festival set its sites high. Soon Super Saturday had engaged the famous Paper Bag Players, "Bug Town Jubilee" from the University of Alabama ("Honestly, the neatest play by students I've ever seen!" says Frances Wray), Vagabond Marionettes from Atlanta, Patchwork Players, Easy Moving Dance Company, touring companies from the Flat Rock Playhouse and NC School of the Arts, on and on. By March 1981, the program read, "Today we celebrate our third year of SUPER SATURDAY. In the minds of the children of our community, this day has become synonymous with fun and merriment. It is a magic day which weaves its own spell of delight and fascination for the young and the young at heart." 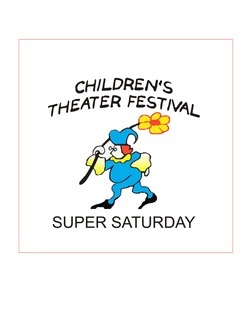 March 29, 2008 was the 30th anniversary of the Children's Theater Festival – aka Super Saturday. But how many people remember that it almost never happened? The launching committee had applied for several grants – not an easy challenge for something that was no more than a hope with no track record. Turns out every single grant applied for was turned down. Without the funds to book performers, there would be no beginning Children's Theater Festival. Organizer Joe Wray was at a loss. One day he passed Franklin McKaig in the halls of Tryon High School, and when McKaig asked the standard "How's it going? ", Wray replied sadly, "I guess we won't have Super Saturday." McKaig replied, "What's that?" Wray explained: a day of theatre for children hosted in Tryon. McKaig asked how much they needed. Wray replied, "$4500." "It sounded good," says McKaig, "and the Tryon Youth Center wasn't active but had a lot of money because a foundation just bought their property. So I talked with Geoff Tennant [also a member of the TYC Board], and we agreed to fund the first Super Saturday." That began an affiliation between the Tryon Youth Center and Super Saturday that has continued through the years. After that first year supplying needed money from its own resources, TYC – usually in the persons of Franklin McKaig and Geoff Tennant – for many years raised funds for the Children's Theater Festival. Franklin and Geoff would go personally to visit local businesses and individuals and ask for their help...quietly seeking donations to sponsor specific shows in full or donate to the general fund. Their quiet personal contact worked wonders! Says McKaig, "Super Saturday got so popular that kids' parents wanted tickets and grandparents wanted tickets. I walked in to these people to get a sponsor donation, and said, 'Okay, if you sponsor a show with $500 or more, we'll give you a sponsor badge and you can take your kids into any show you want – you don't have to worry about a ticket.' Tryon Federal, Owens Pharmacy, Burrell's Fuels, Henson's, Stotts Ford, Tryon Pharmacy – they all would sponsor a show so they could get a sponsor's badge so their kids could go anywhere they wanted!" And in addition to the large donations both corporate and individual, Peggy Constance for years spearheaded a direct mail appeal which allowed many individuals to participate in funding this extremely special day for children. Every gift regardless of size was – and remains – important. But back in late 1978, it almost didn't happen...except that two educators bumped into each other at Tryon High and a comment was passed between them. When Community Schools Coordinator Joe Wray said the first Children's Theater Festival General Chair Emmie Mackey could run an army, he wasn't using hyperbole -- because a small army is exactly what pulling off Super Saturday takes! To this day, Polk County is the only county in North Carolina to mount a full day of children's theatre – an achievement of which this county should be very proud. By the early 1980s Raleigh encouraged other NC counties to follow the Polk example, but no other county has ever succeeded! In October 1987 after the ninth Super Saturday, Governor James G. Martin presented the Children's Theater Festival with the Governor's Award for Outstanding Volunteer Service. When Lee Mueller was Volunteer Coordinator, she facilitated the involvement of over 300 volunteers. 300. Think that through. Says Wray, "Mark Twain once said a man was as confident as a Christian holding five aces. Our talented and harmonious volunteers were our five aces." And then there have been the donors and benefactors from the get-go. Soon into the early programs for the Children's Theater Festival, the list of individuals and businesses donating funds to sponsor Super Saturday gave over 154 names. These were members of this community who valued the Children's Theater Festival as an expression of Polk County's service to its children. Before all those locals ponied up with their checkbooks in 1979, a few locals quietly made it clear that if the new Children's Theater Festival needed extra cash, they would cover any losses. To its pride, such a need has never arisen for Super Saturday; each year enough was earned to have money in the bank to book the following year's performers, thanks to the generosity of donors plus the small income from ticket sales, which remained the original $1 per ticket price for decades. That first Super Saturday in 1979, there was a prime rib banquet following the day's magical success. All who had contributed funds were invited to come, as were all the performers. Jane Dalton, a member of the original planning committee who was also a cerebrated radio personality, put together a performance for the evening with excerpts from Broadway musicals, calling the evening "Where There's a Will, There's a Play." "Where there's a will" – that could be the motto of the Children's Theatre Festival/Super Saturday... the will of the good people of Polk County and neighboring Landrum to provide enrichment to their young people, while having the young at heart have a fine time as well. In 1980 a portly gent in yellow and blue first appeared in Tryon, soon to become a fixture. For lo these many years this chap has appeared on small banners hanging from downtown lamp posts, a huge banner hanging from the center archway at the Tryon Fine Arts Center, appeared on theater program covers and T-shirts...you name it. We are talking, of course, about the logo figure artist Ann McCown created for the Children's Theater Festival in late 1978 – the now familiar fellow in loose tunic with full sleeves, theatrical tights, jester cap and shoes, ruff collar, and holding a large flower. Ann had been asked by the committee launching the Festival to design a logo, and had been instructed to make the figure friendly – like Santa Claus. So: portly, friendly, and in some sort of old fashioned garb. Ann looked through her files of designs and illustrations, not only to create a distinctive logo figure, but also one wearing some sort of costume that could be replicated for "logo girls" to wear as they mingled with the crowd while guiding theatregoers to various venues, and taking part in the noon parade of performers, costumed children, volunteers, bands, and such. 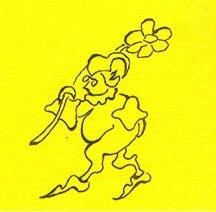 So the logo fellow was born – a jester-type figure with Santa's round profile. Soon Ann refined her design for logo girl costumes, which she and her helpers made. They were blue chambray bloomers with blue sweatshirts, with gingham neck ruffs of blue, green or yellow. Says Ann, "Technically, they would fit any size girl and even some boys, though I don't remember ever having a boy who wanted to wear one. And they carried big gingham daisies, with the color of their daisy matching their neck ruff. These daisies were on long heavy wire stems – a bit hard to carry around, but they looked festive!" In the early days, it was something of an honor to be a logo girl. And over the years, many young people have volunteered to help with Super Saturday – ushering for the various shows, helping set up venues, applying make-up on young performers, running lights and sound during performances, directing parking, serving lunches. Once young people "outgrew" attending the performances for younger children (and before they matured to the point that they realized adults can go just as ga-ga as little ones over theatre fun without blushing), those older youth of Tryon, Columbus, Landrum, Green Creek, Saluda, Mill Spring, Sunny View, Pea Ridge and elsewhere continued to be drawn to this special day of children's theatre, and were eager to help with the day's magic.